Four men have been arrested in the UK over their role in illegal online marketplace Silk Road. Three men in their early 20s were arrested in Manchester while a fourth man, in his 50s, was detained in Devon. The men were initially arrested on suspicion of drug offences. More arrests are expected in the coming weeks. Such sites would be a "key priority" for the UK's National Crime Agency (NCA), its director general said. 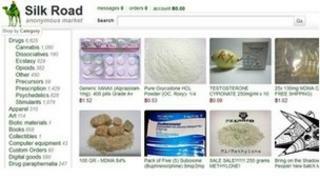 The Silk Road, one of the world's largest websites selling illegal drugs, has now been closed down. Ross Ulbricht, the alleged operator of the site was arrested in San Francisco by the FBI at the beginning of October. Last week 40-year-old Steven Lloyd Sadler was arrested in Seattle. He is alleged to be one of the most prolific sellers on the Silk Road. Silk Road took its name from the historic trade routes spanning Europe, Asia and parts of Africa. News reports and other internet chatter helped it become notorious. However, most users would not have been able to stumble upon the site as the service could only be accessed through a service called Tor - a facility that routes traffic through many separate encrypted layers of the net to hide data identifiers. Tor was invented by the US Naval Research Laboratory and has subsequently been used by journalists and free speech campaigners, among others, to safeguard people's anonymity. But it has also been used as a means to hide illegal activities, leading it to be dubbed "the dark web". Payments for goods on Silk Road were made with the virtual currency Bitcoin, which can be hard to monitor. Court documents from the FBI said the site had just under a million registered users, but investigators said they did not know how many were active. Earlier this year Carnegie Mellon University estimated that over $1.22m (£786,000) worth of trading took place on the Silk Road every month. The site operated on Tor, a so-called "dark web" service that anonymises users, making it much more difficult for authorities to track locations. Such areas of the internet are not covered by standard search engines. The site sold a range of items, but was most famous for offering a host of illegal drugs, paid for using virtual currency Bitcoin. Keith Bristow, the NCA's director general, warned that users who think they can hide their identity on the internet need to think again. "These arrests send a clear message to criminals; the hidden internet isn't hidden and your anonymous activity isn't anonymous. We know where you are, what you are doing and we will catch you." "It is impossible for criminals to completely erase their digital footprint. No matter how technology-savvy the offender, they will always make mistakes." Exeter-based officers worked closely with American law enforcement officers to identify significant UK users of the Silk Road. It is hoped that the investigation will give them insights into how criminals use the dark net. "These criminal areas of the internet aren't just selling drugs; it's where fraud takes place, where the trafficking of people and goods is discussed, where child abuse images are exchanged and firearms are traded," said Andy Archibald, head of the NCA's national cybercrime unit. The Silk Road may now be defunct but it seems that users are planning to resurrect the service. Technology news site TechCrunch reports that Silk Road version 2 could be "ready to launch".